We live in a world where architecture has played a significant role from ancient times to modern day. These awe-inspiring wonders are examples of the creative and innovative minds of talented architect’s whose visions were sometimes outside of the traditional box. 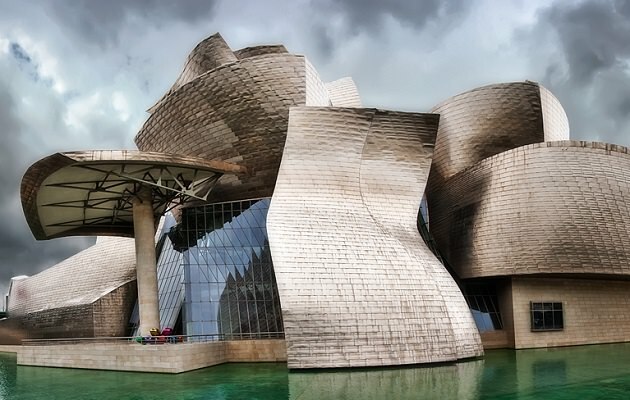 The Guggenheim Museum in Bilbao is one of the most visually exciting structures to observe. It is a combination of tones, textures, and movement for such a massive structure. Throughout the day and evening, both natural and artificial light highlight each panel bringing it alive with color. The building was designed by Frank Gehry and constructed in 1997 using steel, glass, limestone and titanium and comprises 3 floors with 19 galleries with a central atrium as a major focal point. Outside is interesting beginning with the shimmering pool that gives the illusion the museum is floating on the water. Innovative sculptures complement the outdoor atmosphere like the giant puppy guarding the entrance. Designed by Jeff Koons, “Puppy” is constructed with a wire frame covered with an assortment of more than 70,000 colorful plants and flowers. An interior watering system maintains the plants. The spider sculpture named “Maman” is both interesting and intimidating as the spindle-legged spider holds her ground along the walkway as you pass by. The museum itself is a work of art and a “must see” destination for viewing the collections of master artists.